My Momma is very creative. As a Special Education teacher for decades, she used her talents daily by employing unconventional teaching methods to make the curriculum fun and easily digestible. 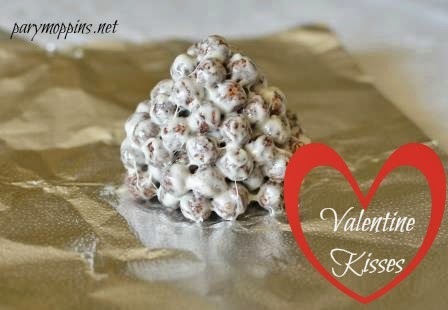 Her creativity extended into our home and it was those quirky, fun, and unusual moments from my childhood that I treasure - like when she made giant "Hershey Kisses." Kisses have such an iconic shape and even their name suggest love and affection - perfect for Valentine's Day. Momma sent me with these treats as my class Valentines one year. They were a hit. I mean, how could a kid (and by "a kid", I mean "I") not want a tennis ball sized "Kiss"? What happens when you combine Cocoa Puffs and Rice Krispie treats? You've done the near impossible by elevating marshmallow treats to new heights, your kiddo is the class hero, and you get the "Coolest Mom of the Year" award. And Moms, you know it's easier to get an Oscar than it is to get the coveted "CMY" award. You can write or print out cute little tags to have sticking out the top. These are not healthy but let's face it, Valentine's Day is not the holiday for the health conscience. Melt marshmallows and butter in a heavy bottomed pot over low heat. Stir frequently. Once they have come together into a smooth pasty goo, throw in the cereal. Take off any rings and BUTTER YOUR HANDS. This is a very important step because this stuff is STIIIIIICKY. Take your funnel and squash a good handful of the mixture into it to give it shape. Tap it out onto a piece of the foil and wrap to look like a Hershey kiss. Hang the tag out of the top of the foil. I managed to get 15 out of a batch with my funnel. Depending on the size of funnel used, you may get more or less than that. Please also visit my fellow foodies' sites to see their delectable Valentine's Day desserts or you can also follow us with the hashtag #foodelicious on Pinterest and Twitter. Oh my gosh, these are so great! I've been wondering what was inside those mysterious wrappers and it did not disappoint :) I bet my nanny babies would love these! Sticky gooey goodness! I love the custom tag too that you can make say anything. Yummy! perfect for Valentine's Day....mess and all! Great way to improve on a marshmallow treat. These are perfect to give loved ones for V-Day. I love this idea! My kids will love these:) So cute! These are so adorable! I love the surprise factor that comes from having to unwrap them - like a sweet little gift :) Pinning to my Valentine's Day Pinterest board so everyone can see!! 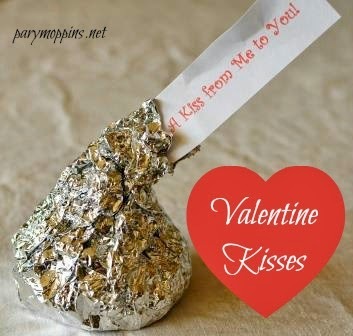 I just love these Valentine Kisses, just awesome! Thank you so much for sharing with Full Plate Thursday and have a great week! I'd nominate you for Coolest Mom of the Year! What a fun treat. I didn't expect Cocoa Puffs to be involved! Thank you for linking this week. I apologize for taking so long to visit. It was a rough week! I'm sorry you had a rough week Ms. Michelle. :( Thanks for taking the time to stop by and say hi.